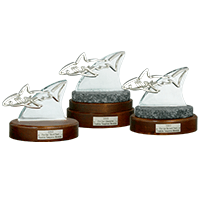 The QBE Shootout trophy, won by Brian Harman and Patton Kizzire, is handcrafted by Malcolm DeMille. 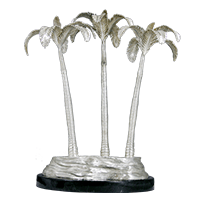 Featuring stunning sterling silver Palm Trees it sits on a sleek green marble base. In addition to the Champions trophy, Malcolm DeMille creates the Pro-Am trophies—a mix of crystal and nickel-plated bronze, which achieves a brilliant balance between modern and traditional elements.